Micro-Epsilon: Monitoring the clamping position in machine tools is an extremely important and critical measurement task. In order to avoid incorrect machining and the high resulting costs, the position of the tool must be detected. Here, the induSENSOR LVP displacement sensor is used. This compact and wear-free sensor supplies a continuous analog signal according to the stroke motion of the drawbar when clamping the tool. In modern machine tools, the tool is normally changed fully automatically. When changing the tools, the machine automatically removes the appropriate holder and places it on the spindle whose clamping system locks the holder in position. If the tool is incorrectly positioned, this can lead to faulty processing. If the tool is tilted, the worst case scenario is that it can loosen which would result in high machine damage. In order to avoid damage and processing errors, it is necessary to monitor the tool position. Often, initiators and switching rings are used for monitoring tasks. However, these are difficult to adjust. With the inductive induSENSOR LVP displacement sensor, Micro-Epsilon offers a significantly easier and more reliable solution based for continuous monitoring of the clamping position. 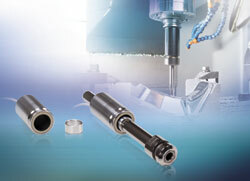 The cylindrical sensor is integrated into the release device of the clamping system. A ring, which serves as a target for the sensor, is simply glued onto the drawbar. Due to its compact size, the LVP sensor can be integrated in different tool types. In addition, it’s a long-life device as measurements are performed on a non-contact, wear-free basis. The sensor enables continuous monitoring of the clamping position and supplies an analog signal according to the stroke motion of the drawbar when clamping the tool. Therefore, it is not necessary to laboriously set the switching point mechanically. The miniature sensor controller can either be accommodated at the point of measurement or in the control cabinet. Together with the induSENSOR MSC7401 controller, this measuring system provides a favorable price/performance ratio at high resolution combined with ease of use.